Children will experience an English lesson daily. English is taught using the Talk For Writing approach. Talk for Writing is powerful because it enables children to imitate the language they need for a particular topic orally before reading and analysing it and then writing their own version. To find out more about the strategy, follow this link to the Talk for Writing website. English is taught through units of work lasting approximately three weeks. During the term children will experience fiction and non-fiction texts, and poetry may be taught as part of the unit, or as a separate unit of work. A variety of writing opportunities will be planned to allow children to practise and apply skills they have learnt. Phonics is taught daily in Reception and KS1. We follow Letters and Sounds, and have introduced the new elements from Curriculum 2014. In KS2 spelling is taught in 3 short sessions each week, learning spelling rules, patterns and strategies for learning to spell tricky words. These follow the Statutory Guidance as set out Curriculum 2014. Grammar is taught in discrete sessions and through the context of the text used in the English unit of work . Each year group follows the Statutory Guidance as set out Curriculum 2014. We promote reading for purpose and pleasure, and reading is at the heart of our curriculum. Children are read to daily in class, and in this way are introduced to a variety of authors and quality texts. Children in Reception begin to read Book Band books, and develop through these until they are secure with decoding and understanding. The teacher regularly assesses the children through Running Records to determine when they are ready for the next band. Where children have difficulty progressing, we have Teaching Assistants who are trained in the FFT and Switch-On interventions, who work on a 1:1 basis with the children, until they have reached age related expectations. At Stenson Fields we have a well-stocked Library, which extends to book corners in each classroom. We have a computerised Library System, which reflects the real life borrowing in our local libraries. The children change their Library books weekly, and are encouraged to choose books which they can read independently, or with an adult. Children are encouraged to read for at least 10 minutes every night at home, and record this in a Reading Diary, which promotes home/school links. Writing is taught as part of every unit of work. Spoken language underpins the development of reading and writing. Children are taught to contribute in different situations, and are encouraged to listen and respond appropriately to their peers and adults. Opportunities for quality talk are planned into English lessons and other areas of the curriculum. All children are introduced to a cursive script which has entry points on the line. We believe this develops confidence, accuracy, fluency and presentation when writing. 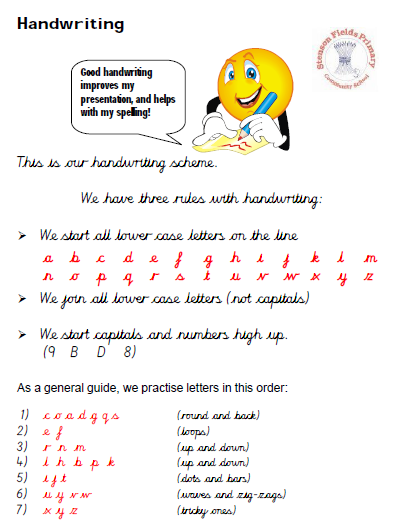 Handwriting is taught in discrete sessions, and when the basic patterns have been learnt, handwriting practice may link to spelling.